Wrong Jovi are the worlds premiere Bon Jovi Tribute band! From greatest hits, to fan favourites, Wrong Jovi are the ultimate way to experience Bon Jovi! Described by tribute band expert (Channel 4’s The Convention Crasher) and TV celebrity Justin Lee-Collins as “the best Bon Jovi tribute band in the world”, Wrong Jovi features some of the UKs finest professional musicians. With a set list crammed full of sing-along anthems, live favourites and rarities, audiences are guaranteed the ultimate Bon Jovi experience. 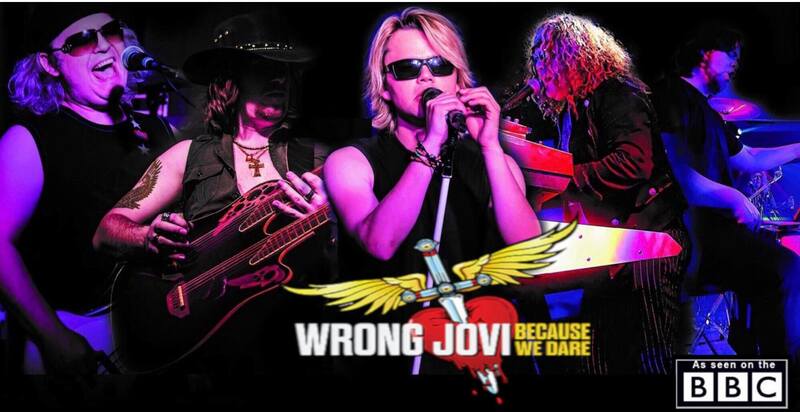 Featuring Ally Ward (X Factor, The Singer Takes It All and Singdate) aka Jon Wrong Jovi on vocals, Wrong Jovi have one of the UKs most talented front men leading the band through some of rock n rolls most legendary songs. Ally is backed by some of the UKs most highly respected musicians. Founding member Mark Harding provides Richie Samboras fiery guitar lines, backing vocals and even lead vocals on occasion. Simon James (David Bryan) on keyboards and Backing vocals, Giuliano Ianarelli (Hugh McDonald) on bass and Backing vocals and Rhys Kirkman (Tico Torres) on drums complete the lineup.